My Literary Geographies work explores the relationships between real and fictional places. This work started with the publication ‘Page and Place: Ongoing Compositions of Plot’ (published by Rodopi in 2014), and has developed into an AHRC funded project entitled ‘A New Literary Geography: Establishing a Digital Literary Atlas of Wales and its Borderlands’ (2016-2018). 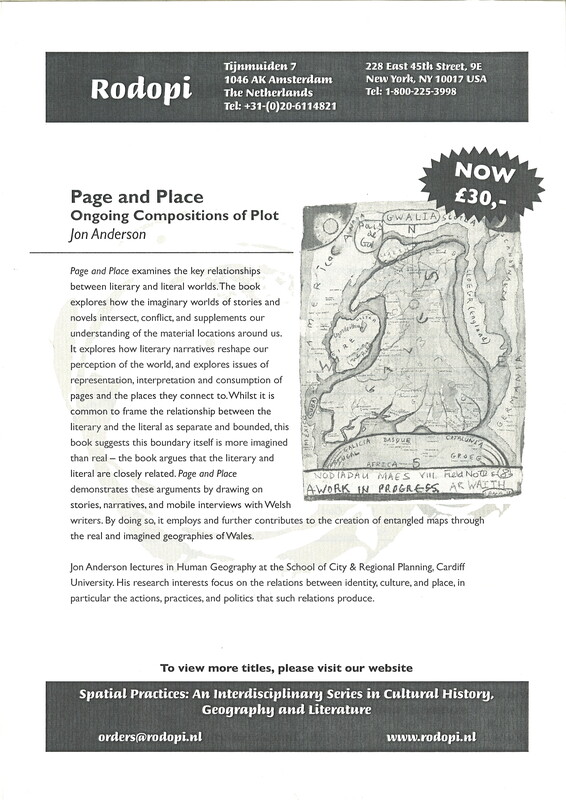 ‘Page and Place: Ongoing Compositions of Plot’ was supported by WISERD, and involved interviewing Welsh authors about the role of geographies in their fictional work. The book argued that the literary and literal are closely related, and that by exploring these connections literature can reshape our perception of the world. Some of the audio-visual recordings from the interviews were used to compile a GIS-informed interactive literary map of Cardiff, which can be found here: www.cardiffplotlines.com (please copy and paste web address into a new window if link not operational). A pilot project that seeks to explore new ways of reading plotlines is being developed here: http://www.spatialmanifesto.com/research-projects/literary-geographies/scrolling . ‘A New Literary Geography: Establishing a Digital Literary Atlas of Wales and its Borderlands’ (2016-2018). This project developed from ‘Page and Place’ and is funded by the Arts and Humanities Research Council. It will become an interdisciplinary demonstration of the power of literary geography to offer insight into the vital connections between people, literature and land. The project will create and evaluate an interactive website, The Digital Literary Atlas of Wales and its Borderlands (DLAW). The DLAW will innovatively map twelve classic and contemporary fictions set in Wales in order to fulfill three objectives: 1) encourage the critical and active reading of fictional narratives; 2) promote understanding of how literature can help strengthen individual and community identity; and 3) enhance cultural tourism. The first project has three phases. The first phase of the project will create the DLAW, the second phase will evaluate the DLAW, whilst the third phase will communicate the project’s insights in policy reports, academic papers, international festivals, conferences, open public events, and the DLAW itself. More details on the project can be found here A New Literary Geography. An interview given to Research Professional which talks about the project and the funding process can be found here. Other work in the field of literary geography.